We all know that love sometimes blossoms online, but can it really happen inside an MMORG? 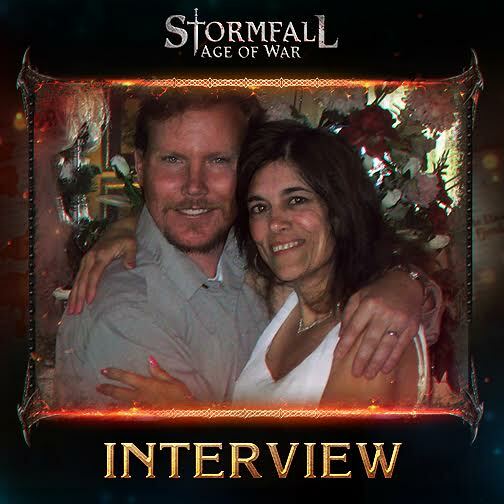 We talked to Robin Laine, a player in the medieval strategy Stormfall: Age of War, about how it all began between her and her husband. Hi Robin, we recently found out that you met your future husband in our game Stormfall:Age of War. We love it! How did it all begin? My husband and I met on Stormfall in the spring of 2013. I had been playing the game for a few weeks and met several people who had friended me on Facebook. However, this was usually so that we could raise Wraiths for each other, more than because we were actually friends. However, I used to write occasionally on the Regional Chat in the game and enjoyed some of the personalities I would meet. One day I was chatting and a mysterious stranger was also involved in the conversation. I recognized his username, having seen him once or twice in the Chat, but we had never spoken to each other before. The first time we spoke directly, I was telling some of the people who had friended me that I would go to their Castle and raise a Wraith. I then told the stranger that I would have raised a Wraith for him too, but we weren't friends yet so I couldn't. So then you added him to your Facebook friends, right? He made a witty remark, and I thought to myself, I like this guy, we ARE going to be friends. Over the next week, we chatted a lot, and it wasn't long before we became very good friends and started developing a more serious relationship. Then you met each other in real life? Yes! Not only that, but he eventually moved 1300 miles just to be with me. The transition was a little difficult at first, partly because the culture where I live is so different to where he spent his younger years. However, he acclimatized quickly, and he has made my life so much better and fulfilling than it was before I met him. Whenever people say that they've met the love of their life in Stormfall, I believe them and know exactly how it can happen! I am always so happy for them, whichever League they are in! Stormfall brings many kindred spirits together, and this is an element that people can build relationships on. I should know: just 16 months after I met that man on Stormfall, we became husband and wife. Although we have differences of opinion on many subjects, we have so many similarities too - some of which are almost uncanny. From the foods that we like, to the music we listen to, and even the type of movies we enjoy. I couldn't have found a better life partner, and I will forever be thankful that Stormfall helped bring us together. A Christmas Miracle: Family Reunited after 4 decades!